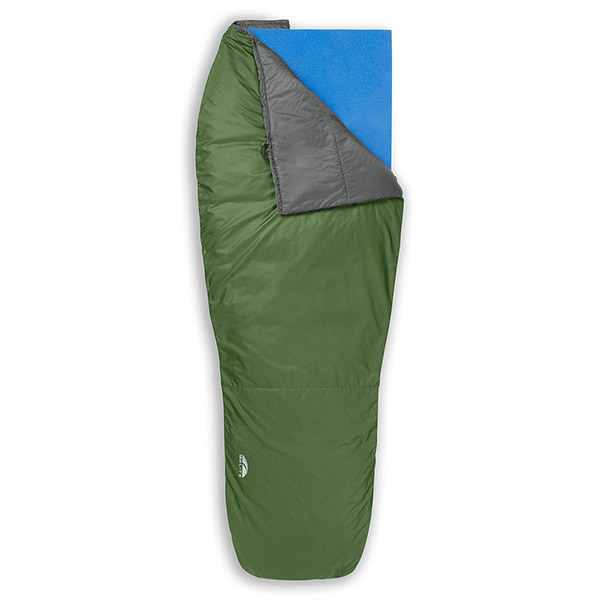 I purchased and received a GoLite RS 1+ Season quilt. The quilt is rated to 40* F so it should make for a nice late spring / early fall quilt. It came with a cotton storage sack, a waterproof recycled nylon stuff sack, the quilt and 2 grosgrain straps. The quilt came stuffed inside the storage sack with all of the hang tags attached to the drawstring of the sack. I pulled the quilt out of the bag and was immediately amazed at both the weight and the thinness of the quilt. The outside shell of the quilt is a 50-denier ripstop and is a green color, while the inside lining is a gray-colored taffeta. The quilt is made virtually of all recycled materials. The texture of the quilt was very slick and smooth. More than that, it was very soft. I dug out my Synmat and quickly pumped it up. I laid down on the mat and then pulled the quilt over me and stuck my feet inside the foot box. I pulled the quilt up around my neck, and then I realized how soft the quilt really was. It was very snugly. The quilt is a long size, so it is plenty long enough to pull completely over my head since I am only 5′ 10″ and it measures 6′ 6″ in length. The reason I went with the long was because the girth was slightly larger on the long. After receiving the quilt I feel that the regular would have done just fine, and would have been slightly smaller (stuffed) and a couple of ounces lighter. Oh well. I did get it at a pretty sweet deal so I am quite happy with it anyway, besides, I would rather have a little extra than not enough! As far as weight, it is listed a 1 lb 9 oz on the GoLite site. On my scales, the actual quilt weighs 1 lb 10.1 oz, the recycled nylon stuff sack weighs 1 oz, and the grosgrain straps weigh 0.4 oz., giving this set-up a total of 1 lb 11.5 oz. I will probably make a stuff sack from some extra silnylon I have lying around to lessen the weight by fractions of an oz, and at this point thinking of leaving the straps behind which will leave off another 0.4 oz and give me a weight savings of about an ounce. With the temperatures we have I will be simply draping this quilt over me at night so there is no need to secure the quilt around me, however once the temperatures drops a little this fall I will probably carry the straps just to try them out. It is a little tricky using the straps and getting them tightened just right, especially since they will be under the pad I will be laying on, but I will try to get a system down. The quilt does feature a single snap button at the head end of the quilt so that the quilt can be snapped closed around me. It also has a drawcord at the head end to cinch the bag a little tighter to help keep warm air in on cooler nights. This seems to be a pretty nice feature, and I am looking forward to using it. Also, the stuffed size of this quilt is a tad bit more than the size of Charmin ( as I have read somewhere, can’t remember where though). It is about the diameter of a roll of Charmin, but is about the size of a roll and a half stacked on top of each other. I will get more precise measurements later. Once I am able to use this quilt a few times I will be sure to write-up a more detailed report. The first night I used the quilt was on an overnight car camping trip in the woods behind my parents house. We have a spot cleared off that makes a very nice camping area and have been known to head there for a night out. Soon after I got the quilt I decided to go out here, just to test it out. The temperatures were a quite warm during the day, so when I first laid down I simply used the Jag Bag silk liner. Later during the night as the temps dropped a little more (around 60 F) and the wind picked up a little, the silk liner didn’t cut it, so I pulled the quilt over me while also staying inside the liner. I slept under the quilt & liner comfortably that night. I next carried the quilt with me on an intended 3-day hike to Cheaha SP in the Talladega NF in Alabama. Again, I used the liner to begin with, and as the night drew cooler, I pulled the quilt over the liner. Here again I was using the tarp as my shelter. The temperatures were probably around the low 60’s here and it was raining with slight winds. Elevations here was somewhere between 1500 – 2000 foot. As I said, this was an intended 3-day hike, but the large amounts of rain killed the spirit, and we called it a trip at the end of the 2nd day, leaving that evening, so I only used the quilt here 1 night as well. Just this past weekend I used the quilt 2 nights on a 3-day hike in the Great Smoky Mountain National Park. This time we stayed in shelters, the first night atop Mt LeConte and the second in the Icewater Springs shelter on the AT atop Mt Kephart. The elevations here were near 6500 feet at Mt LeConte, and just over 5900 feet at Icewater. The temperatures were near mid 50’s each night and the rain came and went. (Luckily we were not caught in them though!) Again, I used the liner and later pulled the quilt over the liner. Of these times I must say I had great experiences with the quilt. I have really come to like using the quilt with the liner. This way if any breezes sneak in under the quilt, the liner takes care of it for me and I hardly notice it (granted the temperatures have not been near the 40* rating that this quilt claims). I still wonder how the quilt will do in temperatures closer to the given rating. Once the times come I will be sure to bring long underwear and a fleece to wear to bed, just in case. (I have a feeling that with my R1, the heavy weight long bottoms, the liner and the quilt, that it will hit the 40* rating, but I will see). I have really enjoyed the small piece of real estate it has laid claim to in my pack. Actually, I have not even used the tiny stuff sack that came with the quilt, but have instead been using a homemade sil stuff sack simply because it is just a little larger than the provided stuff sack. (I have made some changes and going to lighter weight / smaller items as well so there is enough room in the pack.) Also, by using the slightly larger stuff sack, I am thinking that it may be better for the quilt’s synthetic insulation, and may possibly give it just a little more life expectancy. I am a side sleeper, so I pay attention to the placement of the quilt when I roll over. I usually tuck the edges under my side whenever I am in a comfortable position to keep drafts from coming in. This has worked very well so far. I have not used the straps so far, and with the method I am currently using don’t foresee myself using them anytime soon. So, this is it for now. I will be sure to come back and update as often as I can. Thanks. The 40* GoLite RS 1+ Season quilt. I got this quilt late this past spring. I had used it a quite a few times since receiving it but the temperatures were never lower than 55*. This quilt is marketed as a 40* quilt so of course it worked in those conditions. However, last night I got to push the quilt, all the way down to 41* F and under a tarp at that (read: not enclosed in a tent so the 41* temp was true). What I found is that while laying under this quilt in the above described clothing, at 49* I was ready for something a little extra. I was definitely a little cool. I combined this quilt with a silk liner at this point and it perked up for another few degrees, but not many more (about 3 – 4* more comfortably before the “cool” started coming back). I was actually surprised because I thought that I would have a problem with drafts coming in from the sides, however, once it got to this temperature, I noticed that the quilt itself was just cold. While laying beneath the quilt at this temperature, I could just feel the cold pressing through the quilt itself, making me feel cold. Just based on this, I would have to say that for me this is actually a 50* quilt, in these conditions. I understand that some of these conditions could be improved upon which would carry this quilt even closer to its 40* rating, such as being inside a tent or wearing long bottoms / tops, but I was curious as to what this quilt would do for me on its own. And on its own, 50* is my comfort level with this quilt at this point. I am looking at getting the RS, but I am also looking at the ultralight 1. Do you have any thoughts on the UL or any more updates on the RS. Hey, thanks for checking out my site and leaving a comment. As far as the RS quilt, I think that it is a great quilt. IME, for me it is more like a 50 F quilt. When I say this, I mean wearing only a pair of shorts with some light weight (ankle) socks on and a short sleeve t shirt. At 50 F I started feeling cool and had the top snapped and the edges tucked. By adding a light weight Jag Bag silk liner I was comfy to around 47 F and then if I were to add layers I could then take it to the 40 F mark. Also, I must admit, I got a smoking deal on this quilt which is why I have it to begin with. Bent Gate Mountaineering misprinted the price and I happened to come across it at the right time. I pulled the trigger and ended up with it for $21, new. For that price it cannot be beat for sure. Right now you can use the code “DSW10” at checkout on the GoLite site and save 40% off the purchase. This being said, if you are considering the UL quilt, with this discount I would definitely go with the UL. That code will knock right around $100 off, so now would be the time to get it.